In meditation, we notice thoughts, feelings, and physical sensations, and then return our focus to the breath. 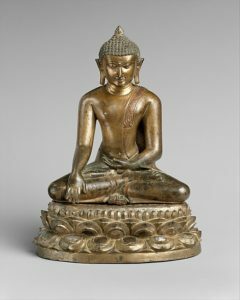 This photo of a Buddha from the Metropolitan Art Museum in New York shows bhumisarsha mudra: the right-hand reaches down, marking the moment of enlightenment when Buddha called upon the earth goddess to witness his resistance to the forces of Mara, a demon of temptation away from the spiritual life. In meditation, sometimes moving into this mudra can bring the mind back from the thought stream, wherever it has taken us. It is normal to experience many feelings and thoughts during meditation. Even the most experienced feel carried away by their thoughts and feelings. For meditation to have the most beneficial effects, it is important to stay with the practice, letting the difficult thoughts enter your mind and then letting them leave, as waves roll in the surf, or as clouds pass in the sky. But when sitting still in meditation becomes difficult and you feel antsy to stop, try this hand mudra, and see if it helps you to refocus.